I hope you are having a super week. I have scheduled a few posts as I am away on a scrap retreat for a few days with some friends of mine. We always have so much fun and I usually don't get a whole lot accomplished but I am hoping to stay focused so I can get a lot of crafting done this year...at least that is my plan, hehe! The treat box is created with My Creative Time's Treat Slider Box and the candies are wrapped with fun papers in my scrap bin. I added a tag using the Stitched Starburst Dies and layered them. 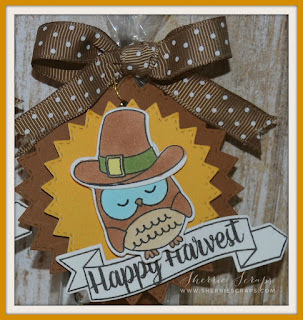 I then added this adorable owl which is from the Gobble Gobble stamp/die set as is the banner and sentiment. I finished with tying on a fun polka dot bow with ribbon from my SU. Cute, cute, cute. Love the adorable owl. Will be a hit for sure. Hope you are having a blast on your retreat. Love these !!! The turkey toppings are so cute thanks for the inspiration I love it. Oh Sherrie, you know I am "owl crazy" so I am madly in love with your adorable little treats! Oh so cute ... I love making these but have to admit didn't think about doing them up for Thanksgiving! You've inspired me! Thanks so much for joining in the fun at our Double D ‘Give Thanks’ challenge! We hope you’ll come back often. I bet you are having a blast at your scrap retreat, how fun would that be! Your project looks so amazing! Your treat packaging is adorable, love that sweet owl! Can't wait to see what awesomeness you create at your retreat! Wonderful treat idea. Love the turkey image. Thanks for sharing it with us at Double D Challenge Blog. We hope to see more of your creations in future challenges. Oh, these are so adorable, Sherrie!! I love those adorable owls!! The papers you used are gorgeous!! These would look so beautiful on a Thanksgiving table!! Thank you so much for playing along at DL.ART!! So cute! I love anything with an owl! Oh so cute! 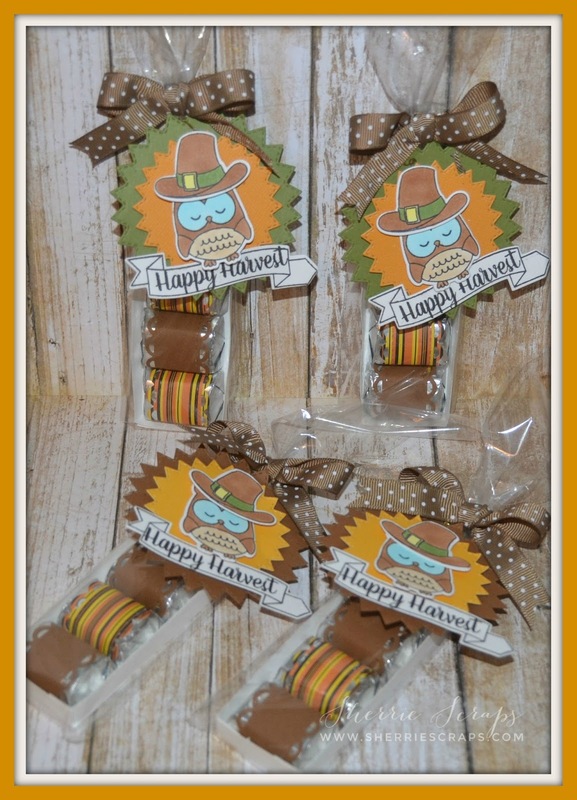 Love those starburst dies and that owl is too cute! Thanks for joining us at DCD's this week! I sure do like the polka dot ribbon with your tag! Fun, yummy treats! These are the cutest little treat boxes! I think these would be a beautiful little gift to place at a table setting for Thanksgiving. Your owl is adorable and I love that beautiful stamped sentiment! Your candies all wrapped in that beautiful fall papers are just so pretty! I hope you have a great time at the retreat! Have fun! Super cute and a great idea for a party favor!! Thank you for joining us for our challenge at Double D! Wow! This is superb. So pretty and very cute. Thanks for sharing with us at Double "D" Challenges. These treats are just adorable!! Love that cute owl tag and the gorgeous colors you used!! Thanks for joining us at DCD this week! I just love these!! What a great thanksgiving treat! I hope you had a wonderful weekend at your scrap retreat!! I love the adorable owls! !Super cute & yummy treats!! Me again! 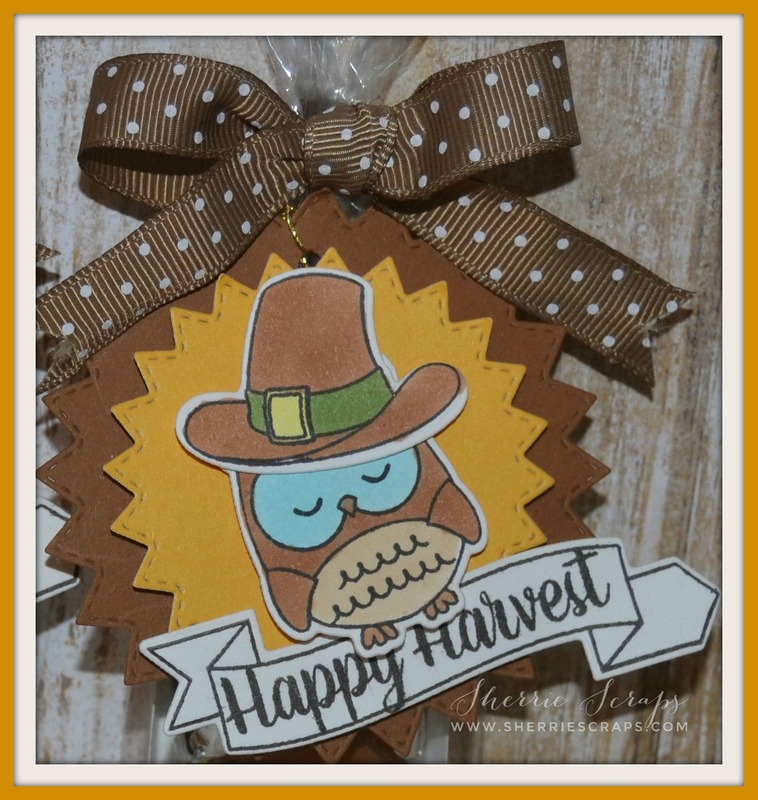 Thank you for joining our “Fall Harvest” Challenge this week at Die Cuttin’ Divas. Awww, these are absolutely adorable, Sherrie! Fabulous colors for fall and LOVE those tags! That set is my favorite from My Creative Time's fall release! Love your little owls in their hats and love those big polka dotty bows! Oh yes, these are perfect for a place setting, I love them!